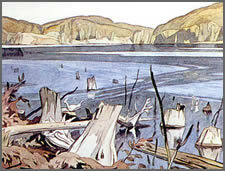 Casson’s friendship with Franklin Carmichael, an original member of the Group of Seven, proved to be the catalyst of his career. Asked to become a member of the Group in 1926 to replace Frank Johnston who had resigned, Casson went on to become known as a painter of Ontario, as was Carmichael. He was able to document many of our rural settings and buildings, as well as his great study of the Ontario landscape with all of the riches that are found in his interpretive paintings of sharply defined colour, shape and contrast. Alfred Joseph Casson, born in Toronto, began to study art with J.S. Gordon at Hamilton Technical School and was apprenticed to a lithographer. He returned to Toronto in 1916 and studied with Harry Britton at the Ontario College of Art and also at the Central Technical School. He met Franklin Carmichael in 1919 and worked with him at Sampson & Mathews, as a commercial artist. Casson became a member of the Group of Seven in 1926 and a founding member of the Canadian Group of Painters in 1933; A.R.C.A. in 1926; R.C.A. in 1939; P.R.C.A. 1948-1952. Casson died in Toronto in 1992 at the age of 94. Today, paintings by A.J. Casson hang in the most important public and private collections across Canada including the National Gallery of Canada. Books and films have documented his life; a lake near Sudbury and a township near Thessalon have been named after him, and in 1979 he was made an Officer of the Order of Canada.